Recently there seems to be a renewed interest in Microsoft’s Hyper-V. The hypervisor is finally starting to mature and it delivers a feature set (and a licensing model) that makes it a compelling alternative to some of the other hypervisors on the market. What some administrators might not realize however, is that there are actually two different versions of Hyper-V. Hyper-V can be installed on top of Windows Server, or it can be downloaded and installed as a standalone hypervisor. So which approach is better? In this article, I will weigh the pros and cons of each deployment type. One of the first considerations that organizations should take into account is the licensing model. It’s difficult to argue with the price of Hyper-V Server 2012 R2 (Microsoft’s official name for the standalone version of Hyper-V). It’s completely free. You are free to download it, install it, and use it for as long as you like without ever having to pay a licensing fee for the hypervisor. Of course just because something is free does not mean that there is no cost associated with using it. When it comes to licensing, the devil is often in the details. With Hyper-V Server 2012 R2, the hypervisor license is free. Even so, you are still required to license the virtual machines that you will be running on top of the hypervisor. In spite of this requirement however, it is still possible to do server virtualization for free in some situations. Suppose for instance that you have physical servers that are running fully licensed operating systems and you want to virtualize those servers. You could host those servers on Hyper-V Server 2012 R2 for free because your operating system licenses have already been paid for. You would simply want to make sure that there is nothing in the licensing terms that would prevent the server operating systems from being virtualized. So what about the licensing model for virtual machines running on top of Windows Server 2012 R2 Hyper-V? Well, if you are planning on using Windows Server 2012 R2 as a virtualization host then I would strongly recommend purchasing the Datacenter Edition. Yes, the Datacenter Edition license costs more than the Standard Edition license, but you will usually come out cheaper in the long run if you invest in a Datacenter Edition license up front. The reason for this is that the Datacenter Edition license allows for an unlimited number of virtual servers running Windows Server 2012 R2. In other words, if you were to install Windows Server 2012 R2 onto a physical box and then install Hyper-V, you would be entitled to create as many virtual machines on that host server as you wanted. You would not have to pay any additional operating system licensing fees so long as the virtual machines were running Windows Server 2012 R2 Datacenter Edition. Of course you are also free to host virtual machines for which the license has already been paid for without incurring any additional licensing costs. After reading the section above, it may sound as though Hyper-V Server 2012 R2 is the ideal choice for organizations that want to virtualize their existing physical servers. After all, in some situations, doing so would allow you to virtualize those servers for free. Even so, running Hyper-V Server 2012 R2 might not always be the best choice. One of the reasons for this is that the Hyper-V Server 2012 R2 interface is minimal. You can see what the interface looks like in Figure A. Figure A: This is the Hyper-V Server 2012 R2 Interface. 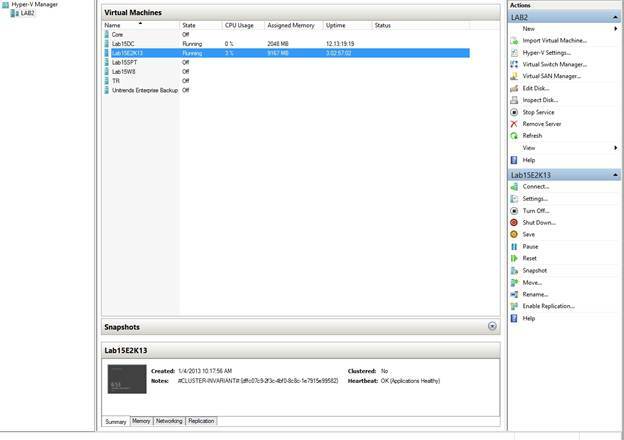 In contrast, take a look at the Windows Server 2012 Hyper-V interface shown in Figure B. Figure B: Windows Server 2012 includes the Hyper-V Manager console. As you can see, Windows Server 2012 includes the Hyper-V Manager, a graphical console that you can use to manage Hyper-V. In contrast, Hyper-V Server 2012 R2 is running on a Windows Server core deployment and does not have a graphical user interface. Instead, it has a menu that you can use to perform basic configuration tasks. As you look at the menu shown in Figure A, it might at first appear that the menu has all of the basics covered. There are options to configure the server’s IP address, set the server name, and join a domain. However, there is something important missing. If you look closely at Figure A, you will notice that the menu does not include any server virtualization related choices. There are no menu options to create virtual machines, start or stop virtual machines, or even to list your virtual machines. 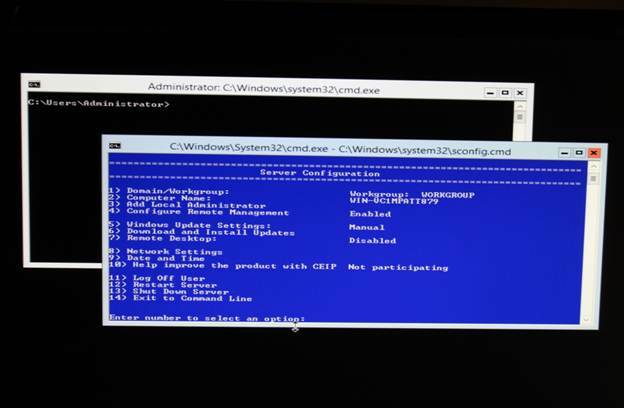 In fact, if I hadn’t told you that the figure was a photograph taken of the monitor on a Hyper-V Server 2012 R2 server, you would have no way of knowing that this particular machine was even running Hyper-V. So how do you manage Hyper-V if you decide to go with Hyper-V Server 2012 R2? Well, you have three choices. The first option is to use System Center Virtual Machine Manager. That is probably your best option, but it isn’t free. Incidentally, System Center Virtual Machine Manager is the management tool of choice for Windows Server 2012 R2 Hyper-V deployments too. Your second option is to create and manage virtual machines through PowerShell. Doing so isn’t easy, but it can be done. The third option is to use Hyper-V Manager running on a remote machine. You can simply use the Hyper-V Manager to remotely connect to the Hyper-V Server. Given the fact that Hyper-V Server 2012 R2 is free and that it doesn’t come with a GUI, it is easy to think of Hyper-V Server as a light weight hypervisor. In some ways this perception is accurate. After all, Hyper-V Server does have a very small footprint. In spite of its appearance however, Hyper-V Server is not light on features. Believe it or not, you can use PowerShell to build a failover cluster using Hyper-V Server 2012 R2. In fact, I recently found a really great article on TechNet describing how you could build an enterprise class failover cluster for free using Hyper-V Server 2012 R2. Where Can I Get a Standalone Copy of Hyper-V? You can download Hyper-V Server 2012 R2 for free here. The download exists in the form of a 64-bit ISO file, and you must register with Microsoft before you can download the software. So which is better, Windows Server 2012 R2 Hyper-V or Hyper-V Server 2012 R2? In all honesty, I’m not sure that one is clearly any better than the other. After all, the core hypervisors are completely identical. Furthermore, Hyper-V Server’s lack of a GUI probably isn’t going to be an issue for most people since most host servers are managed remotely any way. In my opinion, the choice between the two products is probably best based on your licensing needs. If you plan to create new virtual machines then you are probably better off using Windows Server 2012 R2 Hyper-V. If you only want to host VMs that are already licensed then you might be fine using Hyper-V Server.